The head of Deutsche Bundesbank, Jens Weidmann, visits Vienna to receive the Grand Decoration of Honour in Gold (Grosses Goldenes Ehrenzeichen) from Finance Minister Hartwig Löger. In his speech he called for a rapid end to bond purchases by the European Central Bank (ECB). The President of the Deutsche Bundesbank and potential successor to Mario Draghi also calls for monetary policy in the medium term to be in line with the price outlook, to normalise it and thus to regain room for manoeuvre in monetary policy. The goal of a crisis-proof regulatory framework for monetary union can only be achieved in the medium to long term, although the course will be set more quickly, Weidmann said. The asymmetric construction of monetary union - a common, uniform monetary policy combined with national sovereignty in fiscal policy - has proved susceptible to undesirable developments and crises. However, the willingness to Europeanize national sovereignty remains very low. For the time being, therefore, this asymmetry will remain and ways must be found to make monetary union even more stable within this framework. Jens Weidmann is a German economist, president of the Deutsche Bundesbank, and Chairman of the Board of the Bank for International Settlements. 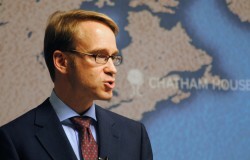 efore assuming the top Bundesbank position in 2011, from February 2006, he served as Head of Division IV (Economic and Financial Policy) in the Federal Chancellery. He was the chief negotiator of the Federal Republic of Germany for both the summits of the G8 and the G20.